This is an age old fable of the tortoise and hare race. Everyone knows who won the race or do you? Well, recently I heard a new version of this story with a new twist. Read this inspirational teamwork story with lessons in teamwork from an age old fable. 1. Once upon a time a tortoise and a hare had an argument about who was faster. They decided to settle the argument with a race. 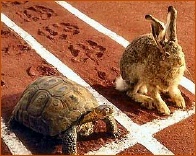 The tortoise and hare both agreed on a route and started off the race. The hare shot ahead and ran briskly for some time. Then seeing that he was far ahead of the tortoise, he thought he’d sit under a tree for some time and relax before continuing the race. He sat under the tree and soon fell asleep. The tortoise plodding on overtook him and soon finished the race, emerging as the undisputed champ. The hare woke up and realised that he’d lost the race. The moral of the story is that slow and steady wins the race. This is the version of the story that we’ve all grown up with. 2. But then recently, someone told me a more interesting version of this tortoise and hare story. It continues. The hare was disappointed at losing the race and he did some soul-searching. He realised that he’d lost the race only because he had been overconfident, careless and lax. If he had not taken things for granted, there’s no way the tortoise could have beaten him. So he challenged the tortoise to another race. The tortoise agreed. This time, the hare went all out and ran without stopping from start to finish. He won by several miles. The moral of the story? Fast and consistent will always beat the slow and steady. If you have two people in your organisation, one slow, methodical and reliable, and the other fast and still reliable at what he does, the fast and reliable chap will consistently climb the organisational ladder faster than the slow, methodical chap. 3. But the story doesn’t end here. The tortoise did some thinking this time, and realised that there’s no way he can beat the hare in a race the way it was currently formatted. He thought for a while, and then challenged the hare to another race, but on a slightly different route. The hare agreed. The tortoise and hare started off. In keeping with his self-made commitment to be consistently fast, the hare took off and ran at top speed until he came to a broad river. The finishing line was a couple of kilometres on the other side of the river. 4. The tortoise and hare, by this time, had become pretty good friends and they did some thinking together. Both realised that the last race could have been run much better. So the tortoise and hare decided to do the last race again, but to run as a team this time. They started off, and this time the hare carried the tortoise till the riverbank. There, the tortoise took over and swam across with the hare on his back. On the opposite bank, the hare again carried the tortoise and they reached the finishing line together. Both the tortoise and hare felt a greater sense of satisfaction than they’d felt earlier. The moral of the story? It’s good to be individually brilliant and to have strong core competencies; but unless you’re able to work in a team and harness each other’s core competencies, you’ll always perform below par because there will always be situations at which you’ll do poorly and someone else does well.